I’ll make a slight digression because I’m developing advertising and publisher materials for my newest completed novel, Lilly. 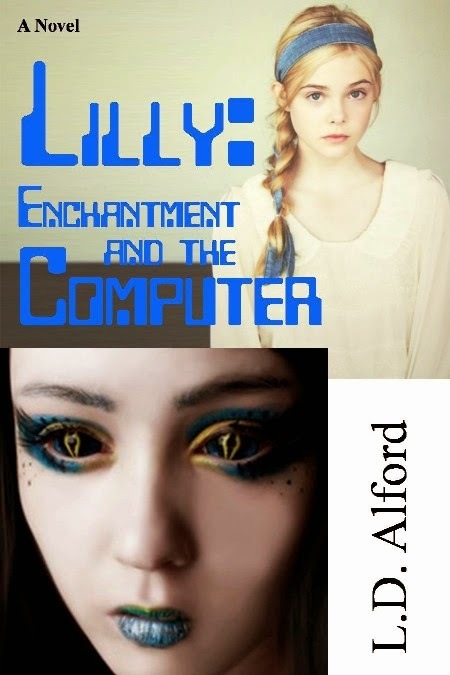 Here is the cover proposal for Lilly: Enchantment and the Computer. The most important scene in any novel is the initial scene. I’m writing about the initial scene of my newest novel, “Escape.” Escape is the working title. I’ll decide on the proposed title when I finish the novel. I’m at the twelfth chapter right now. That means I’ve written about 240 pages. Past the pavement of Shreveport, deep down the sandy dirt and red clay roads, between pecans and cottonwood, maples, magnolias, cypress, and pines, down in the depths of the forgotten, in the center of the unforgiven, in the fields once so bountiful, now so silent, where the magnolias have grown wild, are gardens and buildings and fields and people all overgrown and encircled by a billion stones cleared from a million fields by thousands of coal black men and women. Past all this, buried in the summer sunlight is a house. Antebellum is a yet unpublished and uncontracted novel that could loosely fit in the Enchantment series. It is a complete stand-alone novel that weighs in at only 60,000 words. Can you tell that this is one of my early novels. It may be the first I completed. This is an artsy-fartsy start for a pretty good novel. It might attract a literature publisher–then again, perhaps not. It’s a pity because the novel isn’t that bad. The clouds sifted in brilliant soft puffs across the warming morning. As Heather walked slowly across the grass, moisture grappled the hem of her dress and anointed it as though for worship. The morning sun flashed brightly, lifted by the trees, and the air was clear ­- clear and intoxicating. The voices of songbirds floated quietly in it, and spiced the already flavored day with cinnamon sharpness. Heather hugged herself and trembled with the early morning chill and the fineness of the day. Now, we have character introduction, scene setting, some action (not much), a little mystery (not much). I told you before, I learned not to have prologues (pseudo or otherwise). I learned to place the action scene at the beginning and keep it there. This novel will likely never be published–it’s too bad because it is a fun novel. I could fix it, but the entire novel would be pushed off balance–it’s a novel about a house and not necessarily Heather Roberts. Thanks–just trying to give examples that show how I’ve refined my works over time. I am trying to bring more of the artsy description of my earlier works back into my writing.